I got a kumihimo starter set in a surprise package from Wired Up Beads this summer. I spent the last couple of weeks reading about kumihimo and searching the internet for examples and decided this trip would be the perfect time to try it out. I have made only two braids so far. 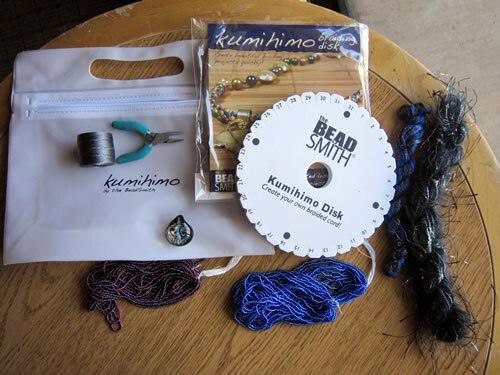 The first one was just to get an idea of how the process works - following the directions that came with the Kumihimo Round Disk For Japanese Braiding and Cording. 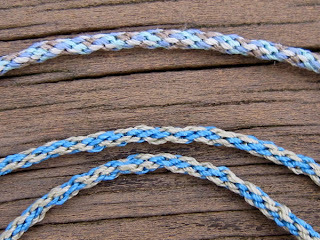 It is an 8 cord braid. The second braid is also done with 8 cords and was supposed to have a spiral pattern. I thought I memorized the sequence correctly, but obviously I didn't. I'll try that one today if I have time. I am using Super-Lon Cord which I bought for micro-macrame. It is the only cord that I have in lots of colors. I also have some thicker 'fancy' cord that came with the starter kit, but I want to get the hang of it before I move on to using that. My next step is to actually do a spiral braid and add beads. 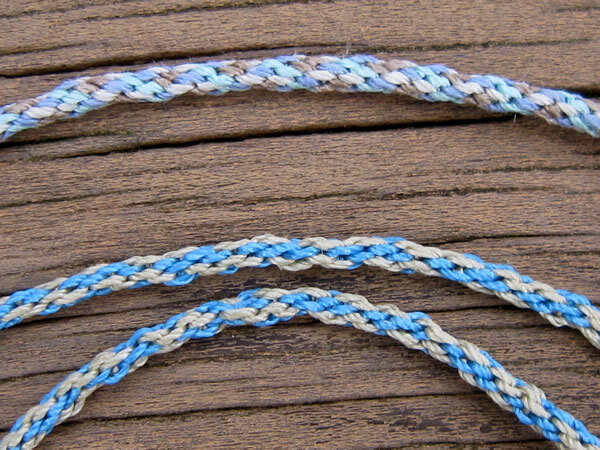 I found this blog with great instructions for a variety of kumihimo braids. It is called Life of Linuz and is in English and Norwegian. Who would imagine I would be learning kumihimo from someone in Norway?? Actually - this is the spiral braid I'm going to try first (the other one is too advanced). 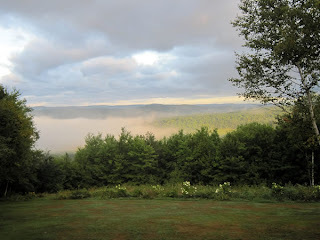 I figured I would leave both links. Thanks for the heads up on the other blog. Also I use Super-Lon for my braiding. If you going for a thicker braid try a 16 strand. 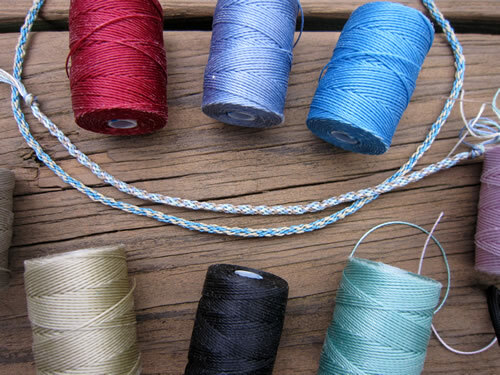 I'm sorry to say that I'm a little discouraged with the Kumihimo. I suppose it's just part of being new to anything - I wanted to have fabulous results immediately. Oh darn - I suppose I will have to practice and learn more! I will try a 16 strand as soon as I have time (football season for High School starts in 2 weeks!). Do you recommend any tutorials or specific cord setup?